Our goal is to make the process of buying or selling real estate efficient, enjoyable and rewarding for you. See what our clients have said about our real estate services and what they have experienced working with us. Mary and I wanted to let you know how deeply we appreciate everything you've done for our family. From start to finish, our entire Real Estate experience with Properties By Hood was outstanding. You made our dreams come true with the purchase of a beautiful new home and flawlessly handled the sale of our existing home, both transactions were seamless. Thank you for always being so willing and available to answer ALL our questions throughout the entire process. Your knowledge, experience and outstanding vendor recommendations gave us peace of mind and a great deal of stress relief. Your attention to detail and fantastic marketing exceeded our expectations and were definitely key factors in the quick sale of our home. It's hard to believe the entire process of buying and selling our home, especially in this tough market, took just over 60 days! Your services are fantastic and again we can't thank you enough for everything. We will definitely recommend and use Properties By Hood for all our future Real Estate needs. From the first day we met Randall and Grace, we knew they would help us find the perfect home. Aside from being kind and personable, they had a very ‘no pressure’ attitude which made us feel comfortable from the very beginning. Since we weren’t exactly sure of what we were looking for, they gave us the personalized attention we needed to narrow down our options and prioritize our needs. Additionally, Randall and Grace were quick to respond regarding new market postings and they accommodated our schedules when viewing homes (most often with our young children). We could not be happier with our new home and we look back on our home buying experience as extremely positive. Regardless of whether you are buying or selling, we would highly recommend Randall and Grace to help you through this life changing event. We could not have asked for better Realtors to guide us through the process. Thank you Randall and Grace! I would like to express my gratitude to Properties by Hood for being great Realtors during my process of buying a house in Encinitas, California in 2007. I had already selected the house that I wanted when I called up Properties by Hood. It was a foreclosure, and the market was just beginning to decline. Unlike Realtors I have worked with in the past, Properties by Hood cautioned me when they felt my bid for the house was over market value. Most Realtors would have simply pushed me to make a bid high enough so that a sale occurred. What I appreciate about Properties by Hood was that they had the integrity to advise me correctly even at the cost of the sale. In fact, when my first bid was rejected, they just hibernated until I was ready to try again. We did, and in fact got the house 30 thousand dollars below the appraised value! I just refinanced and the house is still appraised 22 thousand dollars above my purchase price. I can highly recommend Properties by Hood because they have the integrity and savvy you will need during this strange housing market. Randall and Grace Hood have been an absolute pleasure to work with. 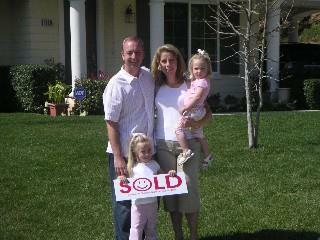 Without them there is no way that our real estate transaction would come close to fruition. Their knowledge, compassion, and willingness to help us cannot be quantified in words. We are very fortunate to have had Randall and Grace represent our real estate interests. Thank you so much for all your help in finding us a place in Southern California. You two are great at what you do and we are glad to have gotten to know you as friends too! Properties By Hood was able to navigate this difficult foreclosure market and negotiate with the bank to allow me to successfully purchase the home I wanted. After placing offers on other properties with other agents only to be disappointed by the lack of response, Properties By Hood was able to secure the house I wanted, on the terms I wanted in just a few weeks. You guys have made my dream come true. God bless you all. Thanks again for all your help. Both of you have been great and very informative throughout this process. It's finally complete! I want to thank both of you for all of the help, insight and direction you provided over these past many months. I would certainly recommend you guys to anyone looking to buy a property. Can I just go on record to say Jon and I have bought/sold 4 houses and have lots of experience with realtors (we have moved around quite a bit). You and Randy have been for me the most professional, pleasant, patient, responsive and just plain fun to be around! Not to mention troopers for gallivanting around in the snow and cold with a bunch of cousins under 10 who are very happy to see each other! I am so blessed to have been able to work with you both. I am also glad for the friendship that has blossomed from it. Thank you for all your help.